Perhaps the best known of Japanese film directors outside of Japan, Kurosawa was the first to gain international recognition for Japanese cinema with Rashomon in 1950. This film, like Seven Samurai (1954), Yojimbo (1961) and The Hidden Fortress (1958), was remade in the West. Kurosawa himself also adapted Western authors, especially Shakespeare (Macbeth, King Lear and Hamlet) but also Dostoyevsky and Gorky as well as popular authors such as Ed McBain/Evan Hunter. This connection and his later work abroad led to Kurosawa’s title as ‘most western’ Japanese director. Internationally, his profile is still very high, partly because his big supporters in the West included the ‘movie brats’, George Lucas and Francis Ford Coppola who helped to make the production of Kagemusha possible by gaining for it an American distribution deal. It isn’t straightforward to pin down a particular style or thematic in Kurosawa’s work. He began making films in the Japanese studio system in 1943 and through his major period of production in the 1950s and 1960s he made both contemporary and historical dramas. His heroes in these films (and they were primarily masculine-centred films) were often engaged in some form of spiritual struggle, sometimes related to their perceptions of themselves as figures in power and sometimes concerned with obsessions or quests. In the comic moments of his samurai films, the power relationship between warlords and isolated peasants or single warriors lies at the centre of the action and this is perhaps one of the attractions of the films for western audiences. Kurosawa’s visual style in his action films was based on dramatic images and a distinctive editing style. The natural world can become a terrifying place in some of Kurosawa’s films and he was very successful at using wind, rain, clouds and mist to create atmosphere in films such as Throne of Blood (i.e. the representation of Burnham Wood on its way to Dunsinane in this version of Macbeth). In terms of editing, Kurosawa is seen as the heir to Eisenstein and the impact of a film like Seven Samurai upon Hollywood filmmakers was enormous. The most obvious disciple of Kurosawa was Sam Peckinpah, who strove to make a Western using techniques like slow-motion in the action scenes. The Wild Bunch (1969) was the result of Peckinpah’s obsession, both thematically and in the final battle scene, to make a samurai movie in Hollywood. The direct linkage between samurai warrior and the gunfighter hero of the American western in the reception of Kurosawa’s work is confirmed for some commentators by Kurosawa’s own evident interest in John Ford as the American director to admire. There are certainly ways in which Kagemusha can be compared to John Ford’s cavalry films of the late 1940s. The Eisenstein reference points to Kurosawa as developing an approach to cinema which emphasises the possibility of dialectical montage – the idea that meaning can be produced by juxtaposing images and sequences which ‘clash’ and thereby set up connections. The ‘shot change’ in this case is not ‘invisible’ as it is in many Hollywood films nor does it suggest the ‘flow’ from scene to scene which can be seen in Mizoguchi’s films. Instead of Mizoguchi’s dissolve, Kurosawa has at different times tended to use the ‘wipe’ – perhaps the most obvious shot change or transition. His films would often be edited so that long periods of relatively static interplay between characters (shot in front-on tableau style) are interrupted by dramatic action. A similar opposition could be made between shots or scenes in long shot intercut with large close-ups. If Mizoguchi’s work was characterised by the unrolling picture scroll, Kurosawa’s work tended to be experienced as the build-up of tension that is released in an explosion of action. Kurosawa made only two films between Red Beard in 1965 and Kagemusha in 1980. Dodes’kaden in 1970, about the fantasies of slum-dwellers in Tokyo, had been poorly received in Japan and had bankrupted the co-operative of film directors who had produced it. In 1975 Kurosawa made Dersu Uzala in the Soviet Union about a hunter in Siberia. The Japanese film industry in the 1970s was in rapid decline, very much affected by television and the new video technology. The remaining film producers were involved with TV spin-offs and films that would work well on the small screen. It is amazing then, that Kurosawa was able to get one of the few remaining studios, Toho, to finance what was Japan’s most expensive feature to date (at only $6 million) and that it should be a 3 hour historical epic, directed by a 70 year-old. Kagemusha was developed from the research for Kurosawa’s second Shakespeare adaptation, Ran (King Lear) which he finally made in 1985. Kagemusha is based on a major historical incident at the end of the 16th century when the powerful Takeda clan was vying for control of Japan. Two other clans, the Oda and the Tokugawa were combined in opposition to the Takeda and the Battle of Nagashiro, which saw the destruction of the Takeda army, was a significant moment in Japanese history. Nobunaga Oda was a modern, forward thinking man, who took control of Japan on Shingen Takeda’s death, only to be assassinated and eventually replaced by Ieyasu Tokugawa – who led Japan into a conservative period of more than two centuries of isolation from the west. 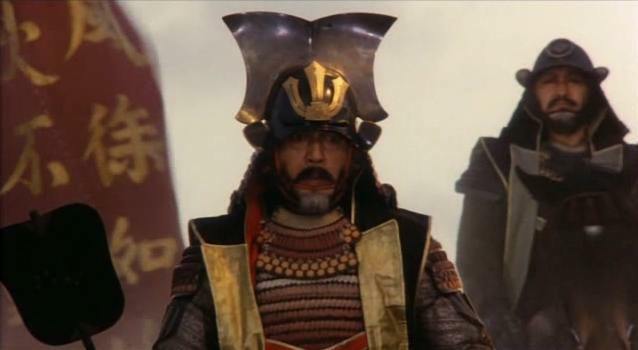 There are effectively three stories in Kagemusha – one about Shingen Takeda, one about the kagemusha or ‘shadow warrior’ (somebody who acts as the double of a warlord/clan leader) and one about the fate of the Takeda clan. This is not a film about the realities of war and its impact on society like Mizoguchi’s Ugetsu Monogatari. Nor is it a ‘combat film’ about warriors or a political strategy film. The events are too mysterious for any of these and Richard Combs (1981) described it as a ghost story, the kagemusha is more shadow than warrior and the generals of the Takeda clan fail because they have lost their lord and wish to join him in death. This view suggests that although the film may look at times like a western epic historical film, it is at heart a Kurosawa ‘spiritual fantasy’. This entry was posted in Japanese Cinema and tagged Kurosawa Akira. Bookmark the permalink. Just finished skimming thru’ ALL your posts… And what a climax I have come to… Kagemusha – a master at work.